I really loved the first book I read from this series, Cassie's Cowboy Crave (which also has my favorite cover from this series). 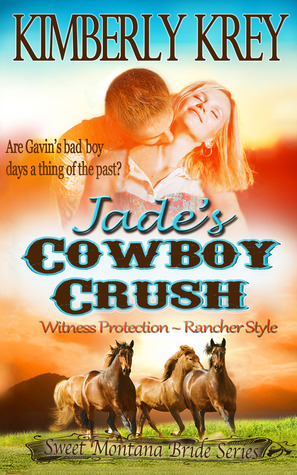 The second book, Jade's Cowboy Crush, I enjoyed, but I didn't feel it had as much of the sass and humor as the first one. 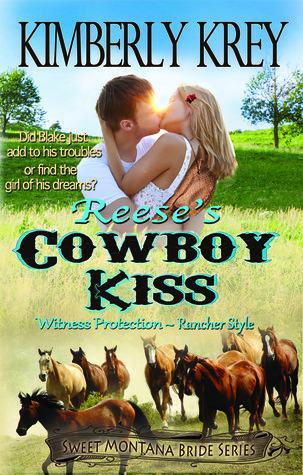 Then we get to Reese's Cowboy Kiss, which is really the first book in the series just written and released last, and I loved that there was plenty of that sass and humor from these characters as the first book, as well as plenty of sexual tension. Oh boy, was there ever! Cassie's story will remain my favorite of the series, but Reese's comes in next. The first time Blake meets Reese I was already cracking up. His expectations were blown away. Not in how you might be thinking. He thought Reese would be a boy that could help out on the ranch and she definitely was not a boy. No siree. Then there were these three wild and jovial ranch hands who live in the basement of the ranch house while Reese and Blake live on the main level. The dinners and entertainment with those guys and Reese were great! I loved how the camaraderie always rubbed Blake the wrong way. He didn't want Reese (at least that's what he tells himself), but he doesn't want anyone else to get her either. Reese was just really sweet, and a Texan gal at that. Blake was hard working and rough and rugged, like he should be. They found themselves in plenty of opportunities to push their relationship forward, but both were a little worried about taking the next step with someone after Reese and no guarantee of how long she'd even be at the ranch. It added some great tension and also some intimate moments of friendship between these too, which I appreciated because they become friends before anything else. This was a sweet romance. It does get plenty steamy and pushed that clean line for me, but was very entertaining. 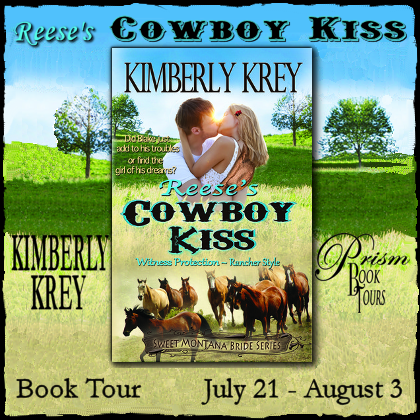 If you're looking for romance with some suspense and plenty of laughs and sizzle, then you'll definitely like Reese's Cowboy Kiss. Content: Clean for the genre - being Adult Romance. There are some pretty steamy scenes, and two closed-door scenes with a married couple. on a ranch or up in the mountains!! I'd have to go someplace I could have my dogs and cats. So, country or woods, possibly mountains? I'd like to be close to a big city, too. I'm spoiled from living in NW Indiana since Chicago is so close. We have the Indiana Dunes and farms close to us on one side and Chicago on the other. It's the best of all worlds. In the city, I love a busy big city and there is so much to do and so many people it would be easy to hide in plain sight. I would go to the mountains. Would love to be located somewhere in another country like Italy, country side. So you wouldn't mind getting to work the land and ride horses. It would be peaceful. I agree. It would be easy to hide. No I definitely wouldn't mind working the land and riding horses!